But to create genomic predictions we need large populations, e.g. 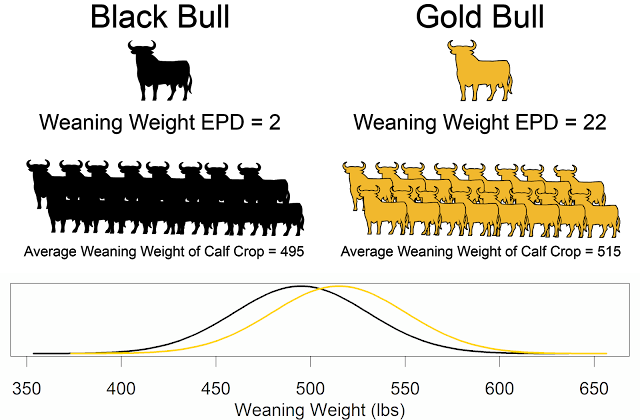 1000s of animals, with phenotypes (trait measurements) and genotypes. BRD can be difficult to measure and quantify; the data can be noisy. Part of the focus of the project was a very careful definition of a sick animal. Temperature, cough, nasal drainage, eye scores, and ear scores were used to define whether or not an animal was sick. Each morning a researcher would walk down a row of calf hutches to find a sick animal and would take a blood sample. The researcher would then find a calf in an adjacent hutch who was not sick. A similar approach was done in beef cattle feed lots. In California, over 200,000 calves were screened to obtain 1,003 cases (sick) and 1,003 controls (healthy) diary calves. In the dairy cattle, genetics explained 21% of the variation in BDR susceptibility. 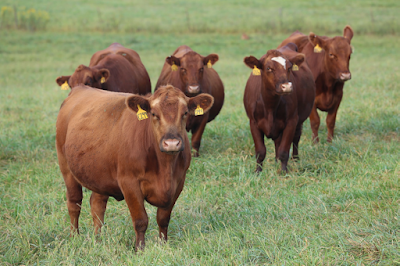 In the beef cattle, genetics explained 18% of the variation in BRD susceptibility. Curt VanTassel is working on incorporating BRD susceptibility into the dairy economic index ($NetMerit). A SNP chip with 220,000 variants has been developed to test variants that are functional. These variants affect the amount or sequence of a protein. It is hoped that these functional variants within genes will be more predictive of the genetic differences in BRD resistenance. In order to produce genomic-enhanced EPDs, we will need to collect phenotypic data on which animals get sick, and which do not. The logical place to do this is beef feedlots, as they record which animals gets sick. We need to figure out how to make this a win-win situation for feed lots, breed associations, and breeders. Disease predictions are not necessarily low hanging fruit. But, if genetic and genomic predictions are successful, they will have a significant economic impact. More information about the Bovine Respiratory Disease Coordinated Agriculture Project (BRD CAP) can be found at http://www.brdcomplex.org/.